If you're anything like me, you like to keep your fleet of private jets up to date. But selling an old Airbus on Craigslist can be a pain, so artist Paul Coudamy hacks them apart and turns them into hanging lamps. 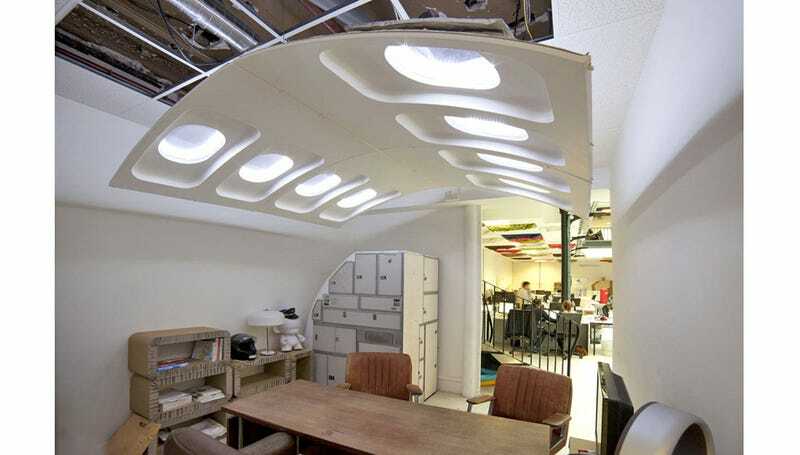 His F-Light—a chandelier for aviation fanatics—is made from the interior walls of a decommissioned aircraft, in this case an Airbus A300, with each window being lined with a luminous halo that recreates the effect of sunlight pouring in while the plane is in flight. The curved form factor of the walls helps focus the light on what's beneath it, and creates a dome-like feeling for those sitting below. And while it's a little out of reach while suspended from the ceiling, I think using the retractable window blinds as a way to adjust the intensity of the lights would have been a clever feature.